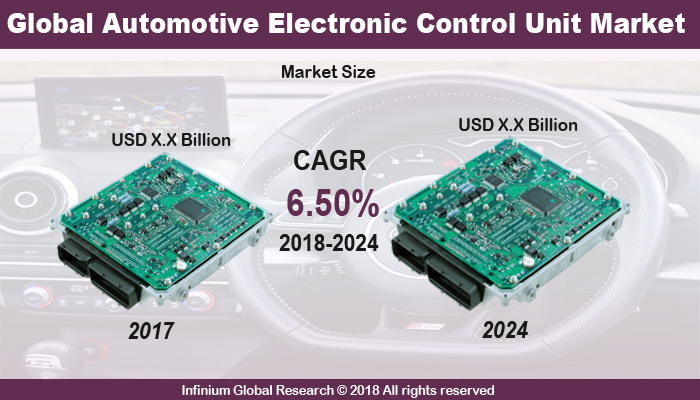 A recent report published by Infinium Global Research on automotive electronic control unit market provides an in-depth analysis of segments and sub-segments in global as well as regional automotive electronic control unit market. The study also highlights the impact of drivers, restraints and macro indicators on the global and regional automotive electronic control unit over the short term as well as long term. The report is a comprehensive presentation of trends, forecast and dollar values of global automotive electronic control unit market. According to the report the global automotive electronic control unit market is projected to grow at a CAGR of 6.5% over the forecast period of 2018-2024. Automotive electronic control unit market is an embedded system that controls the electric subsystem in a transport vehicle. Additionally, the electronic control unit gathers data from the number of sensors installed in this vehicle, which is used to enhance the working of various operations such as fuel injection and spark timing. Increasing demand for technologically advanced vehicles such as a hybrid vehicle is anticipated to be one of the major factor driving the growth of the automotive electronic control unit market. In addition, growing awareness among consumers regarding the reduction of fuel consumption is expected to fuel the growth of the automotive electronic control unit market over the forecast period. However, the increase in complexities in the system is anticipated to hinder the growth of the market. Furthermore, the regulatory bodies of various countries are authorizing the installation of automated safety systems and anti-lock braking systems in a vehicle in order to reduce the risk of accidents. Moreover, the increase in demand for hybrid and electric vehicles and the need for ADAS features are anticipated to provide several opportunities for the key players in the automotive electronic control unit market over the upcoming years. Among the geographies, Asia-Pacific is anticipated to be the largest region owing to the growing focus on the production of automated vehicles with advanced driver assistance and active safety feature. Moreover, emerging economies such as India and Vietnam and rising disposable income among the consumers are the factors driving the growth in the Asia Pacific regions. However, the presence of a large number of automotive manufacturers and suppliers have been experiencing strong economic growth in the countries such as Germany, the UK and Spain. Large companies are striving to retain their market share and maintain their market position. For instance, Visteon Corporation is integrating user-friendly human machine interface and ADAS into its Smart Core combined electronic control unit system. Moreover, the formation of AUTOSAR regulates to develop and design layer between application software and electronic control unit hardware. The report on global automotive electronic control unit market covers segments such as, technologies and application. On the basis of technologies the global automotive electronic control unit market is categorized into the body control system, airbag restraint system, power steering system, climate control system, anti-lock braking system, engine management system and transmission control system. On the basis of application, the global automotive electronic control unit market is categorized into the passenger car and commercial vehicle. The report provides profiles of the companies in the global automotive electronic control unit market such as, Pektron Group Limited, Magneti Marelli S.p.A, Hitachi Automotive Systems Ltd., Lear Corporation, Panasonic Corporation, Hyundai Mobis Co. Ltd., Delphi Automotive PLC, Robert Bosch GmbH, Denso Corporation and Continental AG. The report provides deep insights on demand forecasts, market trends and micro and macro indicators. In addition, this report provides insights on the factors that are driving and restraining the global automotive electronic control unit market. Moreover, IGR-Growth Matrix analysis given in the report brings an insight on the investment areas that existing or new market players can consider. The report provides insights into the market using analytical tools such as Porter's five forces analysis and DRO analysis of automotive electronic control unit market. Moreover, the study highlights current market trends and provides forecast from 2018-2024. We also have highlighted future trends in the automotive electronic control unit market that will impact the demand during the forecast period. Moreover, the competitive analysis given in each regional market brings an insight on the market share of the leading players. This report will help manufacturers, suppliers and distributors of the automotive electronic control unit market to understand the present and future trends in this market and formulate their strategies accordingly.